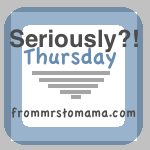 I decided to link up with Seriously Thursday this week. It’s a great chance to vent about little annoyances and get them off my chest. I’m hoping not to be too negative. 1. Seriously?! A Grande Pumpkin Spice Latte at Starbucks this year rings up at over $5! I’m not liking it, so I am boycotting Starbucks Pumpkin Spice lattes. I thought I had just got more frugal since last year… until I cleaned out my car and found a receipt for this treat from last year… the price has gone up over 50 cents from last year! I am not going crazy. I will be sticking to a Grande Skinny Vanilla Latte for $3.58. 2. Seriously?! I love my new car and totally don’t regret our decision, but I have to admit, I am not digging the gas mileage. 22 mpg vs. 31 mpg that I was getting with the Accord. When I drive 70 miles/day just for my commute to work, it adds up! Boo! 3. Seriously?! Why do people gotta be so dang moody. I feel like I’m dealing with this with a few people that surround me. I just want to shake them and say “Do ya expect me to be there for you to do favors/support you when you conveniently feel like being decent towards me? !” I think people need to be required to take relationship classes and learn how to treat people if you want them to stick around. I’m done going out of my way to be overly supportive and nice ALL the time. Consistency, people. 5. Seriously?! I know it’s been a week, but still not too thrilled that that showed Christina Yang getting an abortion on the Grey’s Anatomy premiere. I have a deep love for all babies and it just makes me devastated when I hear about unborn babies being killed… even if it’s just on television. It just seems like anything they start putting on TV becomes mainstream and acceptable. Aw, come on, I'm only on season 1 of Greys! LoL. And I agree... when I see that, or affairs, or anything that I don't find acceptable, it disappoints me. About Starbucks... the pumpkin spice latte only comes around for a super short while. Enjoy it while you can and then go back to your regular. Live a little. LoL!